In the beginning, relax the body. Inhale, and with the exhalation release tension. Inhale, and with the following exhalation scan the body from top to bottom and from the bottom upwards. Wherever there is gripping or tension – relax. The mind is looking at the body with a parental eye. With time one can observe tense areas releasing and embracing space. If areas of weakness are noticed, inhale into them with courage and enliven them with energy. Let excess leave the body; relax. Thus the body becomes stable and quiet. When we position ourselves on the mat we distance ourselves from our responsibility to react to the world. The eyes look inward to catch the inner mood, the state of mind. Whether we are concentrated, dispersed or nervous; happy, sad or angry; whether we are afraid, tired or energetic – the eyes are positioned at the back of the head. We observe ourselves and our practice from an inner silence. With each inhalation the eyes sink deeper into the back of the head. With each exhalation there is an intensification of concentration. Empty mind intensifies itself in practice. Now the body and mind are at ease and stable, quiet and concentrated. From this place we see our objective – sitting, pranayama, asana – and direct ourselves towards it. The mind directs itself to the practice; the body awaits the practice; the heart embraces the practice with all its might. With each inhalation there is an intensification of intent, with each exhalation the sharpening of its direction. By visualizing ourselves sitting, breathing, moving, or by imagining another person in that practice we devote ourselves wholly to it. With each breath, with each pose we reaffirm our intent. The mind rests at the place where the body touches the earth. Let the weight of the body sink into this place – for example, the feet. Intensify the weight pressing down, as if the foot would like to sink into the earth, and then feel the power of that downward movement flowing through the body. As the roots of a tree deepen and widen into the earth, so the branches above expand into the sky. It is easy to understand the idea behind rooting, yet surprisingly difficult to execute it in every movement and posture. As rooting is mastered, the body becomes light and loose and moves without effort. Always be conscious of two opposite directions that are connected to each other. To go up, go down. To go forwards, shift into the back. Wishing for the left side, steady yourself on the right. Wishing to expand, come from the core. The first direction is the arrow, the second direction is the bow; the thread which binds them is connecting. In each pose the farthest limb from the ground connects to that which is rooting into the ground. Every single body part in between is whole in itself, a distinct, functioning unit. All the parts are balanced and work together in harmony. Like a chain floating in space, the rings that make up the chain never touch each other. The more each part is distinct, the more the connection between them remains steady – the body in any situation moves in oneness. Be aware of inhaling, of exhaling. Inhale – go deep within; exhale – connect to the world. Inhale – accept what is; exhale – give yourself to the earth. Inhale along the body, exhale, and root. Inhale and connect the farthest parts, exhale and move into the final pose. While inhaling the body elongates and widens, while exhaling it steadies itself in rooting and connecting. At times the breath is sweet and soft, at times it is deep and long. Sometimes the exhalation lasts longer than the inhalation, sometimes it is short and decisive. At times only in the background, at times the source of action, breath is always present. When there is rooting while exhaling, inhaling brings about elongation and widening. Or perhaps the elongating and widening that occur as a result of rooting allow for inhalation. When elongating and widening occur, not one ring touches another as the chain called body moves in space. Then there is no sagging into the joints, no effort in the muscles. The skeleton shields its coverings; the coverings create space for the skeleton. Thus the body moves about – relaxed and connected – one. All the principles coexist and need to be applied at all times, yet it is difficult to oversee their functions simultaneously. In order to deepen our understanding of the principles, we need to choose one that attracts us and work with it constantly until it is mastered. Many times we can work with one or two principles for a few years until these penetrate and become second nature to us. This while remembering that it is only when all the principles coexist simultaneously in practice, that the practice is whole. Therefore when we practice yet feel “stuck” we need to look carefully and find which principle is neglected, and then revive it. 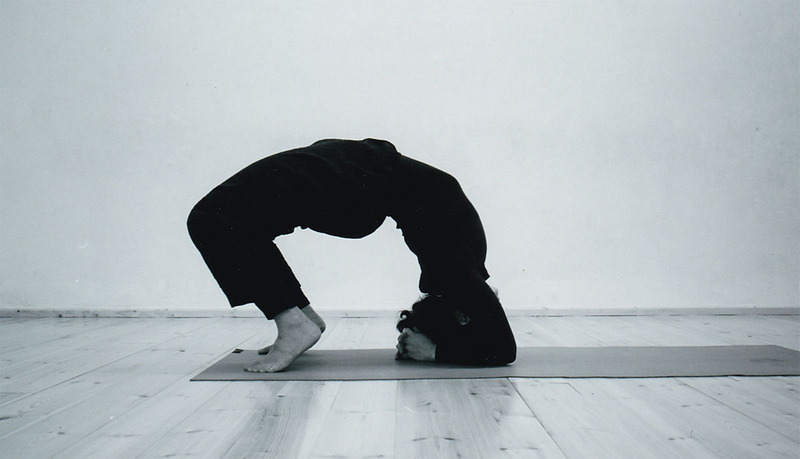 Source: © 2003 Vijñāna Yoga Practice Manual, Orit Sen-Gupta.